Hamas is the largest of several Palestinian militant Islamist groups. Its name is an Arabic acronym for the Islamic Resistance Movement, originating as it did in 1987 after the beginning of the first intifada, or Palestinian uprising, against Israel's occupation of the West Bank and Gaza Strip. It originally had a dual purpose of carrying out an armed struggle against Israel - led by its military wing, the Izzedine al-Qassam Brigades - and delivering social welfare programmes. But since 2005, it has also engaged in the Palestinian political process, becoming the first Islamist group in the Arab world to win election through the ballot box (before reinforcing its power in Gaza by ousting its Fatah rivals). Hamas as a whole, or in some cases its military wing, is designated a terrorist group by Israel, the US, EU, and UK, as well as other powers. Under its charter, the group is committed to the destruction of Israel. To its supporters, though, Hamas is seen as a legitimate resistance movement. In May 2017, the group published a new policy document for the first time since its founding. It declared a willingness to accept an interim Palestinian state within pre-1967 boundaries, without recognising Israel, and did not repeat the anti-Jewish language of its charter. The text was seen as an effort by Hamas to soften its image, though the group made clear it did not replace the charter. In 2006, Hamas won a stunning victory in the Palestinian Legislative Council (PLC) elections, but tensions with the rival Fatah faction of Palestinian Authority (PA) President Mahmoud Abbas heightened. Deadly clashes between Fatah and Hamas erupted in Gaza in June 2007, after which Hamas set up a rival government, leaving Fatah and the PA running parts of the West Bank not under Israeli control. Israel held Hamas responsible for all attacks emanating from the Gaza Strip, and has carried out three major military campaigns in Gaza - Operation Cast Lead in December 2008, Operation Pillar of Defence in November 2012, and Operation Protective Edge in July 2014. The offensives were preceded by escalations in cross-border fighting, with scores of rocket attacks from Gaza, and air strikes against it by Israel. Hamas emerged from the 2008 and 2012 conflicts militarily degraded but with renewed support among Palestinians in Gaza and the West Bank for having confronted Israel and survived. The group nevertheless continued to struggle under the joint blockade imposed on Gaza by Israel and Egypt, and became increasingly isolated after falling out with regional powers in the wake of the Arab Spring. The overthrow in July 2013 of Egyptian President Mohammed Morsi, a key ally, was a further blow. In April 2014, Hamas agreed a reconciliation deal with Fatah that led to the formation of a national unity government, but it has never been fully implemented. Hamas came to prominence after the first intifada as the main Palestinian opponent of the Oslo peace accords between Israel and the Palestine Liberation Organisation (PLO). Despite numerous Israeli operations against it and clampdowns by the Palestinian Authority, Hamas found it had an effective power of veto over the process by launching suicide attacks. In February and March 1996, it carried out several suicide bus bombings, killing nearly 60 Israelis, in retaliation for the assassination in December 1995 of Hamas bomb maker Yahya Ayyash. The bombings were widely blamed for turning Israelis off the peace process and bringing Benjamin Netanyahu - a staunch opponent of the Oslo accords - to power. In the post-Oslo world, most particularly following the failure of US President Bill Clinton's Camp David summit in 2000 and the second intifada which followed shortly thereafter, Hamas gained power and influence as Israel clamped down on the Palestinian Authority, which it accused of sponsoring deadly attacks. Hamas organised clinics and schools, which served Palestinians who felt let down by the corrupt and inefficient Palestinian Authority, dominated by the Fatah faction. Many Palestinians cheered the wave of Hamas suicide attacks in the first years of the second intifada. They saw "martyrdom" operations as avenging their own losses and Israel's settlement building in the West Bank, wanted by Palestinians as part of their own state. After the death of Fatah leader Yasser Arafat in 2004, the Palestinian Authority was taken over by Mahmoud Abbas. He viewed Hamas rocket fire as counter-productive, inflicting relatively little damage on Israel but provoking a harsh response by the Israeli military. When Hamas scored a landslide victory in 2006, the stage was set for a bitter power-struggle with Fatah. Hamas resisted all efforts to get it to sign up to previous Palestinian agreements with Israel, as well as to recognise Israel's legitimacy and to renounce violence. Hamas's charter defines historic Palestine - including present-day Israel - as Islamic land and it rules out any permanent peace with the Jewish state. The charter also repeatedly makes attacks on Jews as a people, drawing charges that the movement is anti-Semitic. Hamas has, however, offered a 10-year truce in return for a complete Israeli withdrawal from territories occupied in 1967: the West Bank, Gaza Strip and East Jerusalem. It insists though that millions of Palestinian refugees stemming from the 1948 war must be allowed to return to homes in what became Israel - a move that would threaten Israel's very existence. After the death of Sheikh Yassin, Khaled Meshaal became the group's political leader in exile. He was succeeded by Gaza-based Ismail Haniya in May 2017. 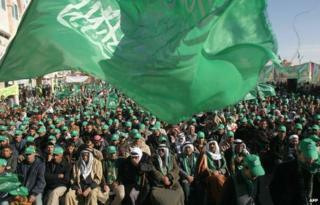 Hamas's decision to stand in elections in 2006 was a major departure for the movement. The new government was subjected to tough economic and diplomatic sanctions by Israel and its allies in the West. After Hamas ousted Fatah from Gaza in 2007, Israel tightened its blockade on the territory, and rocket-fire and Israeli counter-raids continued. In December that year, Israel launched Operation Cast Lead - a 22-day offensive aimed, Israel said, at halting rocket attacks from Gaza. More than 1,300 Palestinians and 13 Israelis were killed. Israel cited the same reason for Pillar of Defence in 2012- which began with an air strike that killed Ahmed Jabari, the Qassam Brigades commander. Some 170 Palestinians - mostly civilians - and six Israelis died in the eight-day conflict. Palestinian sources say Hamas largely tried to maintain calm after the conflict ended, with the Qassam Brigades not joining in the rocket attacks on Israel. But Hamas also did not move to halt the rocket fire altogether, apparently because it was concerned that Palestinians would see it as less committed to fighting Israel than rival militant groups, particularly Islamic Jihad. Rocket fire increased in mid-June 2014 when Israel arrested many Hamas members across the West Bank while searching for three murdered Israeli teenagers. Then on 7 July, Hamas claimed responsibility for firing rockets at Israel for the first time since 2012, and Hamas and Israel became embroiled in the most intensive fighting for months. The fighting ended after 50 days with a ceasefire. At least 2,189 Palestinians were killed, including more than 1,486 civilians, according to the UN. On the Israeli side, 67 soldiers were killed along with the six civilians.